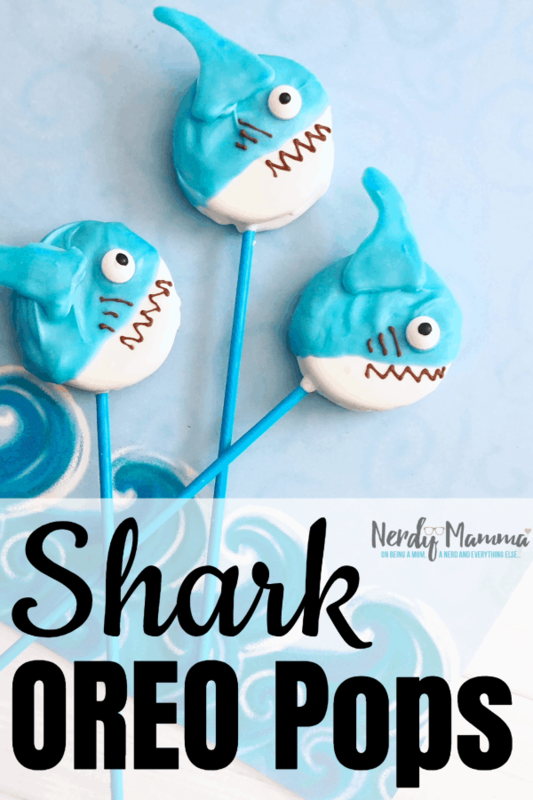 Inside: I cannot wait for summer this year, or Shark Week this year, or anything…nor can I wait to devour a million bites of these Shark OREO Pops. No kidding, they’re amazing. 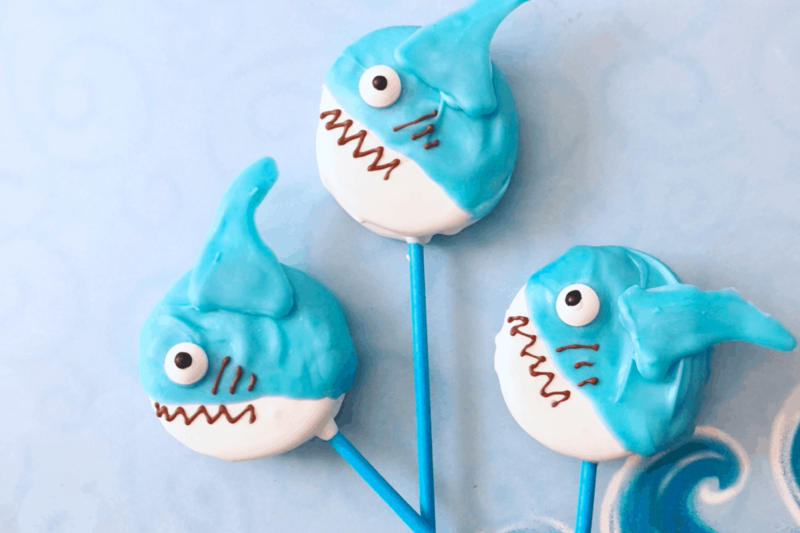 Let me start by saying that I did not set out to make these Shark Oreo Pops for any real particular reason other than I kind of wanted a chocolate-covered OREO and I didn’t want to drive to the store. But then, I opened the pantry and low-and-behold! There was a bunch of blue Wilton Melting Chocolate just sitting there, taking up space. Thus, the idea was born. 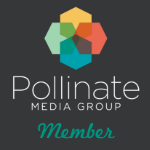 Not so much the biting–but they’re pretty cool creatures if you stop and learn a bit about them, like during Shark week…if it’ll EVER get here. 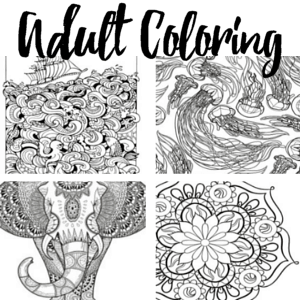 These are so easy, I even made you a little video to show how they come together. 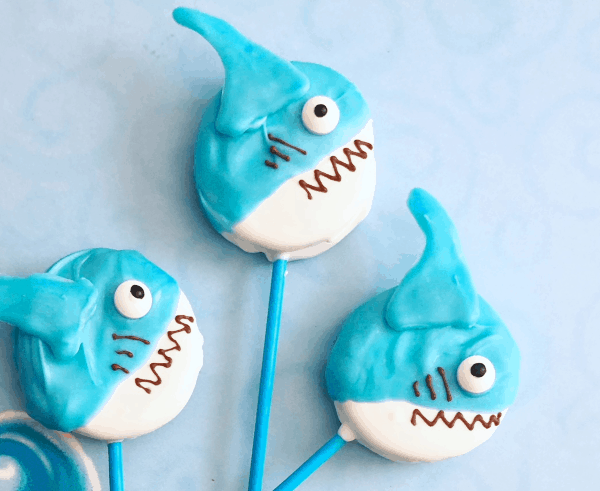 Oh, and if you don’t know how to decorate your Shark Oreo Pops, that’s ok. Just grab some icing and go to town. 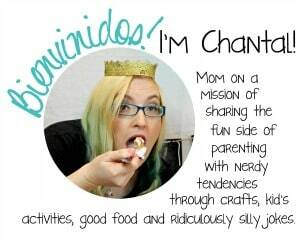 If it’s messy, just tell the kids that the shark ate something and got blood everywhere. They’ll laugh and laugh. 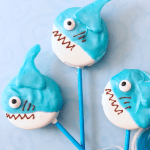 Don’t forget to also pin these Shark Oreo Pops, so that you can find them again when Shark Week comes by in July (if it will ONLY get here, sigh). 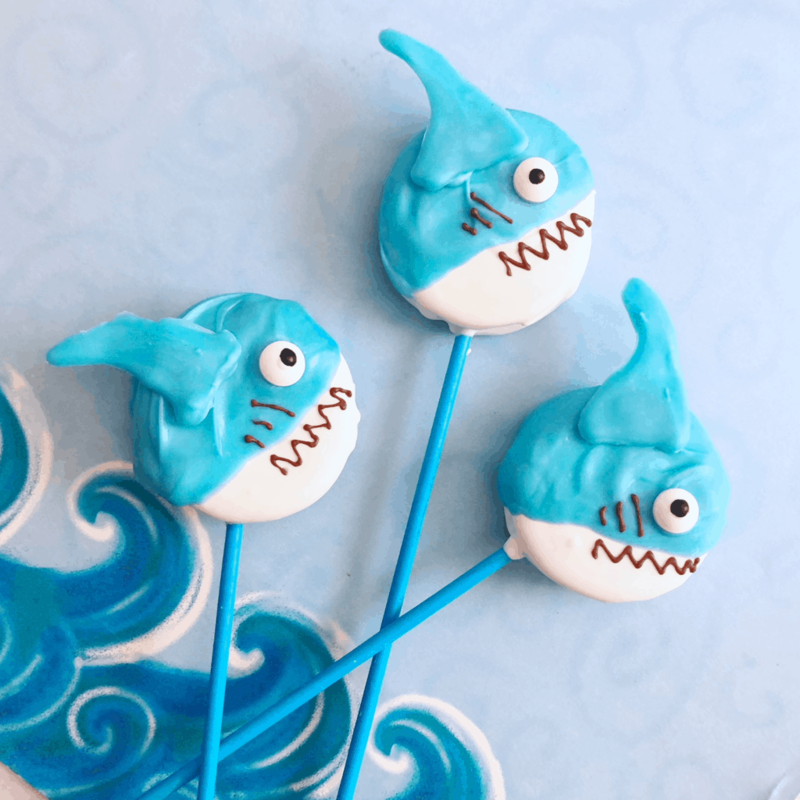 I cannot wait for summer this year, or Shark Week this year, or anything...nor can I wait to devour a million bites of these Shark OREO Pops. 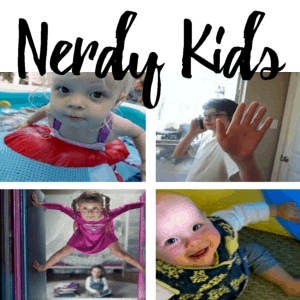 No kidding, they're amazing. In a small microwave safe bowl, heat 2 cups of the white candy melts on 50% power for 3-4 minutes, stirring every 30 seconds until melted. Carefully open an OREO, dip a lollipop stick into the melted white chocolate and press gently onto the frosting side of the OREO. Add a little more melted white chocolate onto the center of the OREO and carefully place the OREOs back together. Transfer to the freezer for about 5 minutes or until the chocolate inside has hardened. 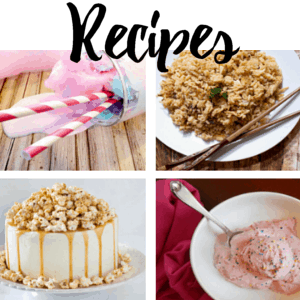 Hold onto the lollipop stick and dip the OREO into the melted white chocolate, let any excess drip off, place onto a piece of parchment paper and transfer to the freezer for 15 minutes. In a small microwave safe bowl, heat 2 cups of your light blue candy melts on 50% power for 3-4 minutes, stirring every 30 seconds until melted, pour a small amount into a decorating bag and cut a tiny tip off the end of the bag. Use the bag to draw 1” shark fins onto a piece of parchment paper and transfer to the freezer to harden. Dip the Left side of the white OREO into the melted blue chocolate at an angle, let any excess drip off, place a candy eye onto the blue on the right side and transfer to the freezer to harden. Carefully peel the shark fin off the parchment paper, dip into the melted blue chocolate and stick onto the left side of the shark OREO. In a small microwave safe bowl, heat 1 cup of your light cocoa candy melts on 50% power for 2-3 minutes, stirring every 30 seconds until melted, pour a small amount into a decorating bag and cut a tiny tip off the end of the bag. 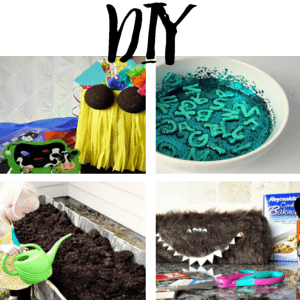 Use your decorating bag of light cocoa candy melts to draw on zip zag teeth on the bottom white on the OREO and a few lines on the side of the eye.